Did you know, less than 50% of small businesses in the US offer healthcare? We’d like to change that in Summit County. 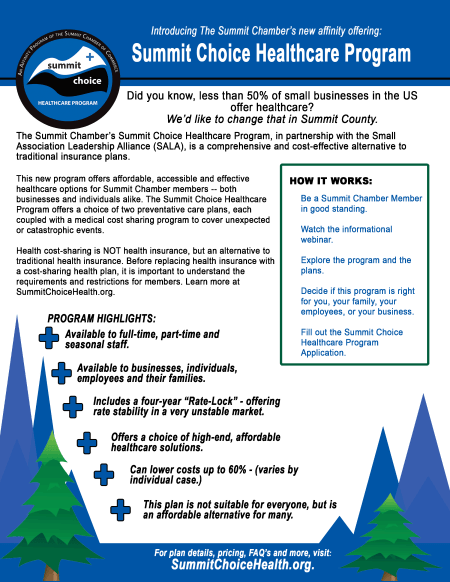 The Summit Chamber's Summit Choice Healthcare Program, in partnership with the Small Association Leadership Alliance (SALA), is a comprehensive and cost-effective alternative to traditional plans. This new program offers affordable, accessible, and effective healthcare options for Summit Chamber members – both businesses and individuals alike. The Summit Choice Healthcare Program helps businesses provide for the medical expenses of their employees through a community-centered approach and gives individuals access to high quality, affordable healthcare. This program is not insurance. It is an alternative solution that features a choice of two affordable preventative care plans, each coupled with a medical cost sharing program to cover unexpected or catastrophic events. Participants can expect to save as much as 20% to 60% when compared to traditional health insurance! The Summit Choice Healthcare Program, in partnership with SALA, is one solution to the high cost of healthcare in the mountain region! May not be for everyone, but for some it is the best solution. Be a Summit Chamber member in good standing. Click here to view the membership benefits by level. Watch the informational webinar. Viewing the webinar will be the best introduction to this program and will help you understand the documents and resources below. Explore the program & plans. Click on the icons below to explore plan details, coverage specifics, FAQ, Key Terms and real-world savings examples! Decide if this program is right for you, your family, your employees or your business. If it isn’t, don’t be discouraged – the Summit Chamber and our partners are committed to expanding the Summit Choice Healthcare Program. We will continue to pursue more options and ways to fill coverage gaps. Fill out the Summit Choice Healthcare Program Application. 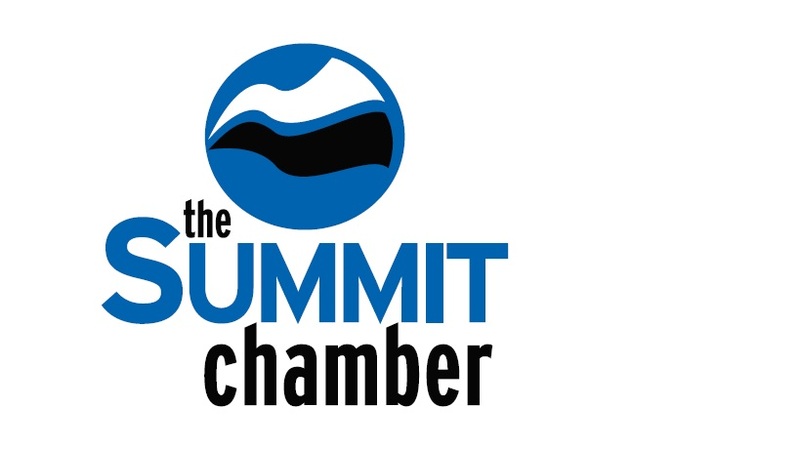 If you are unsure if you are a Summit Chamber member, please call 970-668-2051 or email info@summitchamber.org and representative will provide you with the information. Medical Cost Sharing is not health insurance. Before replacing health insurance with a medical cost sharing plan, it is critically important to understand the requirements and restrictions for members. For example, most medical cost sharing organizations exclude or limit the amount eligible to share for pre-existing conditions. Accordingly, Medical Cost Sharing Group Plans are not appropriate for groups of 50 or more where employees with pre-existing conditions might not be covered and the employer could be subject to a tax penalty. Likewise, there are exclusions for irresponsible behavior, including an accident or sickness related to drugs or alcohol. The website for each organization has the necessary detailed information to enable an informed decision. Summary: Medical cost sharing is not insurance where a premium is paid and the risk of major medical expenses are assumed by the insurance company. In medical cost sharing the patient deals directly with the doctor or hospital without the interference of an insurance company actuary. Secondly, the patient becomes a responsible, cost-conscious consumer rather than only being responsible for a co-pay and no concern what is charged to the insurance company. The application for medical cost sharing has a limited number of health history questions, but all potential members must agree with and attest to statements including: “I agree to refrain from the usage of any form of illegal substances.” Accordingly, medical cost sharing plans are not for everybody, but a practical solution to managing costs for health conscious individuals. The general information provided here has been taken from reliable resources. However, The Summit Chamber does not provide insurance, legal or tax advice. We recommend that you seek competent legal assistance for any questions on the forms and applications that you are required to sign to apply for membership to a medical cost sharing organization. The Summit Choice Healthcare program is not insurance and the Summit Chamber is not an insurance agency or provider. This is in no way considered to be solicitation, negotiation, consultation, placement, management or administration of any policy, program or plan of insurance of any type, including but not limited to any self-insurance program.This program is sponsored by the Small Association Leadership Alliance with primary healthcare plans provided by Apex Management Group and a Medical Cost Sharing program provided by Sedera Health. If you're looking for a traditional insurance plan? View our Business Directory.